Okay, so I’m not actually talking about a real-life burglary. In reality, what I’m talking about is much worse than that! And, chances are…you have also either been “robbed” in the past, or it is currently happening to you. Most of us find ourselves in one of these situations. In what ways have you and I been robbed? We’ve been robbed of the simple pleasures of “stopping to smell the roses.” These moments have been replaced by schedules that are just too intense. We have lost many irreplaceable moments with our loved ones because it was just too hard to say, “NO” to yet another “good” activity. We find ourselves always rushing around with great ministry opportunities, but we never find quality time to pray or read our Bibles. Our schedule is crowded with many admirable activities, and yet, we feel empty. We sometimes feel like we are just going through the motions. We are truly far from being fully alive. In my last blog, “Chai Tea and Front Porch Living”, I shared how God has been showing me the importance of living more fully and savoring each moment He gives me. (And by the response I received, it is apparent that many of you desire more joy in life as well.) God, so faithfully, continues showing me HOW to live more fully and with more joy. I wish I could tell you that I have this “thing” mastered and never struggle with it anymore. The truth is, I don’t struggle WHEN I do the things He has shown me. But, just like Peter in the Bible, my eyes have the tendency to to be drawn back to my surroundings rather than remaining focused on Jesus. That is always when I begin to sink. So these are the six steps that have helped me to be more in touch with life and to live more fully within each and every precious moment God gives to me. 1.) Determine the difference between following other people’s DEMANDS versus following God’s COMMANDS. God gently leads us. If we feel frazzled or stressed, we are probably not following HIS leading. I believe there are many things that each of us do, simply because of the expectations of others. We are afraid of disappointing them and are afraid of what they will think of us if we don’t participate. We, however, are responsible to God to say “no” to everything except the BEST things. (As a married woman, I know I am greatly blessed to have a husband who can help me to determine what I should be focusing on. I desire and need this so much!) Remember the saying, “The good is the enemy of the best”? It is a very true statement! One day, each of us will have to give an account to God for how we lived each moment of our days. We will also give an account for how we nurtured and influenced those who were affected by our daily choices–large or small. 2.) Stop comparing yourself to what others HAVE or are ACCOMPLISHING. We have all definitely inherited this “Eve mentality.” Instead of looking at all that Eve had been blessed with, she had her eyes set on the one tree that wasn’t meant for her. This attitude is rooted in lust and jealousy and has destroyed many friendships and relationships. When we see others accomplishing more than us, we have the tendency to try to discredit or find fault in them because we wish we were doing what they do. 3.) Refuse to believe the lie that MORE is always better. More money, more opportunities, more activities…Just because one teaspoon of vanilla makes a cake taste good doesn’t mean that one cup will make it better! (I learned this lesson the hard way when I was ten years old. My loyal dad didn’t say anything, but kindly tried to eat my chocolate cake…and he kept burping up vanilla flavoring for almost a week! Sorry, Dad!) It is really hard to for us to grasp that more is not always better, especially when it involves wonderful ministry opportunities. 4.) 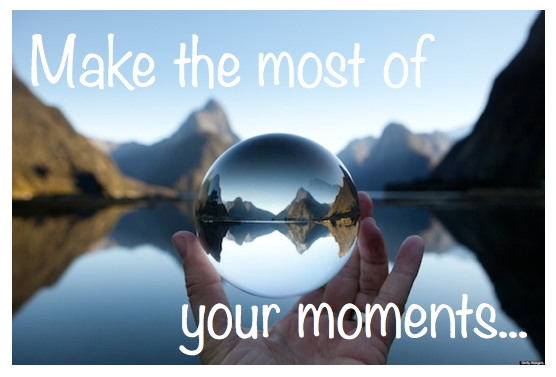 Stop planning for a better future and begin enjoying the moment. Look for the opportunities you have today to spend with your children. Show love and respect to your spouse NOW, not after they change some annoying habits or wrong priorities. Make the most of every minute you have with your family or friends TODAY. How often do we find ourselves planning the “perfect” Christmas celebration or another special event, as we neglect the current needs of our loved ones? 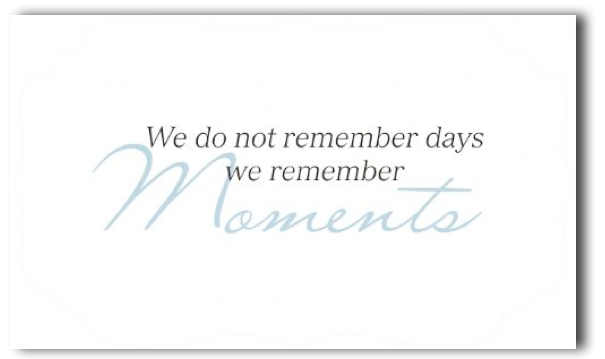 Some of us may spend lots of time designing our picture-perfect memory albums instead of creating the special memories. 5.) Put down your phone! (No one likes this one!) The electronic age we live in can greatly hinder us from being fully engaged in the moment. It’s great to capture special moments and stay in touch with others, but there needs to be established boundaries or it will soon consume our lives. If we always pick up our phones to check Facebook, emails, or to get to the next level of Candy Crush, while we are standing in line at the store, (or anywhere else) guess who we are overlooking? The people all around us. Those hurting, lonely people who need a smile or an encouraging word. What are you making more important than them? Do your family members get frustrated with you because you are often preoccupied with your phone, iPod, or computer? Don’t let your electronics consume your time! This last step has probably been the most life changing one for me. I guarantee, it will change your life when you do it! 6.) Give thanks! Give thanks! Give thanks! I mean giving thanks for the “little” things like: the soft green grass, the beauty of white, fluffy clouds in a blue sky, the morning song of a robin, the smile from a friend, the delightful hug from your child, the strength and energy you have, the delicious sandwich your wife prepared, even the dirty dishes in your sink! As you begin counting your blessings rather than your burdens, you will find yourself rejoicing because of the many gifts you’ve been given by your Father. I have never felt more joy, contentment, or like I am more “alive” than when I am consciously counting my small, every-day blessings. I feel like I am just on the beginner’s level of this one, but I know it changes my complete outlook when I practice this step. It is the KEY to true joy and contentment! Jesus said that we should become like a small child, and isn’t it very evident how a child delights in “little” things? A dandelion among the weeds, bubbles in the air, interesting pebbles, and a swing ride at the park…These things fill them with joy, and they can spend hours delighting in the same things that we, adults, hardly notice and usually take for granted. Let’s become like little children–giving thanks and truly delighting in the “little” blessings. Someone who is able to enjoy life to the fullest doesn’t always have much, but they are always aware of the blessings they DO have! So here’s the challenge…Will you join me in taking these six steps in becoming more filled with peace and purpose, and having more joy and blessings than you ever realized was possible? These are the reminders I have written down for myself, and I pray they will equip you and provide much joy in your journey as well. 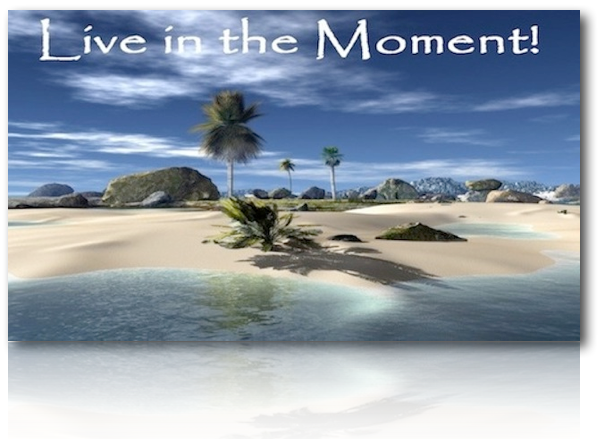 May God help us to live FULLY in our MOMENTS! Thank u for allowing God to speak thru u . I love #5 ! The most special family moments we have enjoyed as a family have been what we call a” no phone” nite ! I am looking forward to the wks ahead enjoying each moment.May God continually guide n direct u !